How much value is added by more size, an additional bedroom, or the newness of the house? Today we take a detailed look at the components of a typical Irvine house and reveal what the market is saying about value. Over the last two posts on the Irvine Housing Market, we have looked at aggregate totals for Irvine and at individual neighborhoods. The nitty-gritty is in the details. What features in homes do buyers value in the market? Today we take a careful look at the devil in the details. Global Decision is an analytics consulting firm. While our methods are not industry-specific, our engagements are skewed towards specific industries in Southern California, such as real estate (along with online gaming and restaurant chains). We specialize in applying both foundational and advanced analytics to better understand business and economic issues. Today’s post is part three of our series on hedonic housing valuation in Irvine. The goal of a hedonic housing valuation model is to use all information about a sale, including both the sale price and the characteristics of the home (number of beds, number of baths, square footage, etc.) to understand how the home’s value is derived from its constituent parts. Wikipedia offers a good overview of hedonic regression or see the Global Decision tutorial on how to build your own hedonic regression model. What factors are used in Hedonic Housing Models? The choice of which factors to include in a hedonic housing model, or any regression model for that matter, are often driven by (1) availability of data and (2) general insight from the model builder or wisdom of the team. In our case, a background review of other hedonic models along with generally accepted intuition drove the initial set of factors. For some example results, please see http://www.hnb.hr/publikac/istrazivanja/w-019.pdf. The .pdf link is a well-written and thoughtful hedonic model created by the National Bank of Croatia to better understand home price trends in that country. On page 22 of this English-language document, the authors list the factors that fed into their model (which focused more on attached housing, the most prevalent dwelling type in European cities). For the city of Zagreb, they have many of the same factors as we have for Irvine: floor area, number of rooms, garage, neighborhood, and a few specific to them such as type of heating, presence of an elevator, and other items that generally add value in urban attached housing units. What factors are using in the Irvine Hedonic Housing Model? What about the quote that you can make an elephant’s trunk wiggle with 5 factors? Overfitting of a model occurs when you use so many factors that you are losing the general meaning of each factor and instead creating a level of fit that is very specific to the data you are analyzing. There is always a danger of overfitting when using small datasets with lots of factors. Because our model has over 7,000 data points, using 8 factors plus time is not likely to produce overfitting. One useful output of the Irvine Hedonic Housing Model is that we can understand how the factors associated with a property drive market value. We looked at the “neighborhood” factor in detail in the previous post, and today we explore results from the other factors. Good models often confirm the intuitive: all else equal, we’d expect a one-story property to command a premium and a 3-car garage is a plus for most buyers. The numbers reflect these facts. A one-story property commands a premium of 4.3%, and a three-story property creates a reduction in value of 3.8%. While the direction of these impacts is intuitive, the model helps us understand the best estimate for the magnitude of such impacts. The impact of just “adding a bedroom” is often near zero. To understand this result, first recall that the result is really the impact of “adding a bedroom where all else is held constant.” So a Woodbridge, 2-story, 1977, 3-bed/2-bath, 1800 sq ft home becomes a Woodbridge, 2-story, 1977, 4-bed/2-bath 1800 sq ft home. Yes, you’ve added a bedroom – but you’ve really stolen the space from other rooms because the total square footage of the home is held constant. For this reason, it’s not uncommon that hedonic housing models actually produce a slight negative impact from just the addition of a bedroom. Most homes are constructed so that the addition of a bedroom is coupled with the addition of square footage – leading to an overall gain in value given both impacts. Irvine buyers love bathrooms. Each one adds almost 4% to the value of the property. So if that’s the case, why don’t we see 3-bed/6-bath properties? The Irvine Hedonic Housing Model fits a relationship between property attributes and value based on the data fed into the model. The vast majority of homes in our dataset have between 2.0 and 4.0 bathrooms. Thus, the specific relationship indicated by the model is generally valid in that range. A three car garage adds 5.3% to the value of a property, relative to having the baseline 2-car garage. One can debate the impact of a 3-car garage on the aesthetics of a SFR, but it’s beyond question that the market value of a home is increased with such an attribute. As an aside, the standard error of that particular measure is just 0.3% — meaning that it’s very probable that the 5.3% estimate is close to the true incremental value of the 3-car garage. All else equal, adding a year to the age of the structure creates a small reduction in value (0.6%). Over many years, however, this creates a large premium for newer properties. There are many possible reasons for this situation: newer properties have lower repair and maintenance costs; they are built from superior materials (no lead/asbestos); they have more functionality (electrical outlets on every wall); and they are more energy efficient; and they meet modern design aesthetics. You can see the generally linear relationship between the square footage of a property and the sales price. In order to model this in our model (which predicts the % change in values) we have to change our thinking. Instead of looking at adding an extra 100 sq. ft. of size, we need to think exponentially. Our model looks at adding x% of size to the house. By doing so, we end up with a value flow-through ratio. We define this flow-through ratio as the ratio of increase in size to the increase in property value. In our case, we have a flow-through ratio of 44% for square footage and 11% for lotsize. If we double the size of the square footage, we generate a 44% increase in property value. Similarly, for lot size, if we double the size of the lot, we generate an 11% increase in property value. Because “doubling” of either lotsize or property square footage is not often a reasonable design choice, we prefer to couch our metrics in terms of “adding 10% to” the relevant factor. An increase of 44% for doubling of size works out to an increase of 3.7% for each 10% increase in size. Have Irvine buyers changed preferences over time? One conclusion from the above chart is that Irvine buyers have consistently assigned similar values to the underlying factors of the properties purchased. With the exception of an extreme spike in the value-add for a 2007-2008 “one story” property, the other value-adds are relatively constant over time. This is a surprising result: we know that property financing was dramatically different in pre-bubble and post-bubble periods. There is also much talk about the “foreign cash buyers” (FCBs) and other buyer prototypes that impact the Irvine housing market. We can now rest assured that these shadowy figures assign the same general valuation to the features of the property as John and Jane Q Public who are out shopping for a home. Another possibility is that the ratio of buyer prototypes active in the market has remained constant over the 11 year period of study. Perhaps the FCB has consistently purchased the same percentage of Irvine housing stock over time. Further study of loan data by property is needed to confirm or reject theories regarding composition of the buyer pool. The one variable that appears to be trending down in impact is age: the fact that homes are older appears to be of less concern to 2009-2011 buyers (vs. 2000-2003 buyers). This is, in part, explained by the fact that Irvine experienced a number of new neighborhoods from 2000 to 2011. Back in 2000, there was little “new” housing in Irvine – almost all sales were between 15 and 32 years old. In 2010, there was a sizable cluster of homes between 4 and 15 years old and a cluster of homes between 22-26 years old, and then homes 30-40 years old. This distribution reflects the boom-and-bust history of Irvine home values. When values are dropping (see 1991-1996), demand is low and few homes are built. As the vintage Irvine neighborhoods get older, the average degradation in value (per year) is reduced. Having worked for homebuilders most of my career, I was intrigued by the data on home features (below). Builders have long known there is a penalty for only having one bathroom. Originally, one bathroom homes were created for cost: bathrooms are expensive. However, over time, it became apparent that buyers were willing to put dollars toward bathrooms, so builders seldom fall below the standard of two bathrooms per home. For a time, builders experimented with larger and larger bathrooms and more of them. There seemed to be no limit to the buyer's appetite for bathrooms. Have you noticed how master bathrooms are almost as large as the bedroom itself? This is no mistake. Buyers are demanding this space. Builders have also wrestled with the provision of a third story to add square footage to houses with very small ground floor footprints. Buyers don't like them. The third floor is generally limited to 500SF for code reasons, so when builders add this space, they can only add 500SF. Since they also diminish the value of the final product by 3.8%, there is almost no additional value created in third story construction. The Irvine Company has experimented with this design in several communities, and it continues to prove unpopular. The addition of a third garage stall has also been a difficult builder decision. If these three garage stalls are side-by-side, it makes the house much wider, or consumes the entire front elevation which makes the house unattractive. There is unquestionably an increase in value when adding the third car, so builders and architects have experimented with tandem garage arrangements where three cars can fit into the width of two. The three-car with tandem configuration is popular because most people use the tandem space to store their stuff. Rarely do people actually park three cars in their three car garages. As long as the third garage stall — which is very inexpensive square footage — adds 5.3% to the value, expect builders to provide this space. They would be foolish not to. I was not surprised to see additional lot size added little or no value. The Irvine Company figured this out years ago. Lots in Irvine are 10% to 20% smaller than lots in surrounding communities, yet Irvine actually commands a premium. 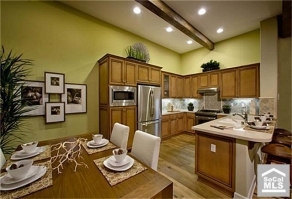 On a per-square-foot of lot basis, the Irvine premium is remarkable. And since the Irvine Company is in the business of selling land, obtaining a huge land premium is the focus of all their efforts. I expect to see lot sizes shrink even further as the Irvine Company increases density to further increase their land value. This may create opportunity for competitors, but the Irvine Company will likely ignore what competitors are doing and focus on increasing their land value. I was not surprised to see the preference for new or the flattening of values as properties age. A 40-year old property is not much different than a 25-year old property if both have received the same owner care. I rented a 40-year old property in University Park for over three years that was renovated prior to my moving in. The property felt new to us, and I wouldn't have valued it any more or less than a comparable property in Woodbridge that may have been 15 years newer. Newness wears off after about 10 years, and properties older than that are valued based on how recently the interior was updated. I want to thank Jaysen again for this great analysis. I hope you have found it as valuable and as enlightening as I have. Builders never used to sell on the MLS. To a builder, commissions are just a cost. They would rather pay their own employee a small percentage for the listing, and pay nothing to a buyer's agent. Rather than pay 6%, they only want to pay 1% or perhaps 2%. realtors have always tried to sell themselves as adding value. They convince sellers they can market and sell a home and obtain more money than they cost in commissions. For typical homebuyers, access to the MLS is worth the price they pay. However, builders think realtors are full of it. Despite their reservations, builders are now selling properties on the MLS. Is this desperation, or a wise move to market their product? Given the current state of sales, it is probably a bit of both. Only time will tell. Enjoy nearly single level living! All living on second floor (only oversized laundry room and storage below. This home has dramatic 12 foot ceilings in the living areas and a spacious open kitchen and great room leading to an outdoor private deck. Dual masters with generous closets and bathrooms, as well as a third separate bedroom. Fixtures include gourmet kitchen with granite countertops, stainless steel appliances, upgraded hardwood flooring, and more included options! Located in the desirable Village of Woodbury, just outside your door is shopping, parks, pools and more. One of the last opportunities to own a brand-new home in Wodbury. Charming motor courts provide access to oversized 2 car attached garages. Within walking distance to stores, restaurants, entertainment at Woodbury Town Center, and it's less than two miles from the I-5 and even closer to the 133 Toll Road. $2,500 Design Credit available! The Mello Roos number below is a guess based on the assumption that it would be 1% of the purchase price. This entry was posted in Library, News on July 13, 2011 by IrvineRenter. This is a very interesting analysis and some attributes are similar to mine – such as the 4:1 ratio for square footage to lot size. I have a question for you – when you use the 2000- 2011 period, how do you account for the trend in the market? Are you breaking up your valuation into grouping of years into bands as you show in one of your charts above? There is also one additional variable that is hard to incorporate into the spreadsheet – specific pockets command a premium. I’m going to rework my model similar to yours for the Northwood area and compare results. I hope the info@ address is one where I can contact you off-line when I have a chance to look at this further. We’ve really taken two approaches regarding the trend in the market. First, the model itself has a dummy variable called “yq” which contains a distinct value for each year-quarter combination (such as “yq2002-3” for Q3 2002). Doing so gives us a series of coefficients in the resulting regression that represent the impact of time, holding all else equal, on the value of Irvine housing. A drawback to hedonic models is that they assume that the basic drivers of value don’t change over time. This assumption is always violated to some extent, so we ran separate hedonic models for year bands (2000-2003, etc.) to validate that what drove value in Irvine in the past continues to drive value in Irvine today. As far as specific pockets, we have not gone more granular than the “village” level for Irvine, with a few exceptions (Old vs. New Northwood). However, if you could identify a few pockets that really boost value (maybe view homes in Quail Hill for example), you have some potential for improving the model. I believe our model itself could improve in the next iteration by splitting Westpark into 2-3 groups based on age of structure. We’ve kicked around some ideas for model improvement, and we think that adding a flag for “major locational negative,” such as backing to Culver, the 405, or high voltage transmission lines. Of course we’d love to hear any other ideas that the IHB readership might have. The Santiago school pocket in Northwood for instance commands a premium in my model. I tried using the satellite coordinates without success to do this automatically, but maybe there is potential on those lines. Interesting — in other cities, we’ve thought a lot about adding school districts/zones. There are databases you can access (for a fee perhaps) that map homes and or a lat/long to a school. In Irvine, we theorized that schools are a second-order impact due to overall good quality of schools in the city. It’s still something I’d love to test. It may not just be the elevation that lends to the premiums in the Turtles and the Quail… they are the path to University High School. Or it could be a chicken/egg quandary. Would be very interesting to add mello roos dues (percentage change and or the lack of them) and HOA dues to the model – how much does the house price go up or down based on paying 1.8% mello roos vs. no mello roos for example. Absolutely. Unfortunately, this data was harder to get, so it’s not in this version of the model. The dollar amount of Mello-Roos is probably our #1 desired add going forward. Logically, Mello-Roos are a huge negative due to the addition of 20%+ (0.8% for 30 years for example) to the true cost of a home. They hit especially hard for anyone who bought at peak pricing. A 0.8% Mello-Roos on a home that’s experienced a 40% decline in value (Ladera Ranch might be a good example, but let’s wait for the hedonic model results) is now a 1.33% Mello-Roos, with almost no possibility of a reduction. In rare cases a developer might reduce Mello-Roos by paying them down, but only when it’s in his best interest. We’ll if a 1 story house adds 4.3% and a 3 story house takes away 3.8% what would a 2 story house do? I think what Jaysen is saying is that the 2-story house is the baseline and those numbers are relative to 2-story houses. You got it — 2-story homes are the baseline. While you could pick 1- or (3-story) homes as the baseline and then turn the crank on the mathematics, one common convention is to use the most frequently occurring characteristic as baseline. This convention helps when looking at the statistical significance of deviation from baseline because it avoids baseline categories that are small and thus subject to more fluke and chance. As long as the third garage stall — which is very inexpensive square footage — adds 5.3% to the value, expect builders to provide this space. They would be foolish not to. Unfortunately, any new projects since the 2010 New Home Collection in Irvine have all been 2-car garages. The only one selling new 3-car homes (tandems not the “classic” 3CWG) is Las Colinas and that was a tract being sold prior to 2010. And maybe just as bad as losing that 3rd car space, a trend in new home building is the omission of the driveway. There are many detached condos (can’t call them SFRs) with the bad aesthetic of the frontal garage but it’s on a shared motorcourt instead of a proper private driveway. So while new home stock in Irvine does have Great Rooms and huge master baths… it has not so great garages and disappearing driveways. I may be dealing with a smaller sample size (last 2 years of Northwood), but the parking space correlation to sale price is very low (correlation factor of 0.06) for this year. I’m not surprised by the trend, and it’s not intuitive to me that for a 650K home, an additional garage adds nearly $35K in valuation – I’m going to take a fresh look at this. One stat that jumps out though is that older homes are correlated with fewer baths and bigger lot sizes. I meant ‘parking space correlation to sale price is very low (correlation factor of 0.06) for this neighborhood’. Per lot size – I think there are a few exceptions to the rule. For example, in Turtle Rock I see some older (early 70s) homes that have smaller square footage but a big lot going for a premium because the buyer can tear the house down and have a lot big enough to build a big new house on it. This comment dovetails well with an important concept: regression models are best fits for all the data points. In a sense, they are like an average that tries to take into account the impact of all the factors on the value of a property. However, specific exceptions can and will occur. The R-squared (stat-speak for how well the model fits the data, ranges from zero to one) for the Irvine model is unusually high at 0.956. Irvine is an a truly exceptional area, for its lack of exceptions to the rules. Be careful about Northwood. There were quite a lot of 2-car tandems built there in the late 80’s and early 90’s. In every case, the option of utilizing the tandem space as a finished room was offered by the builders. And as it was a decision that had to be made before the slab was poured, most homes could have been finished that way originally, or retro-fitted later. It’s nearly impossible to tell from assessors records because the sq.ft of the homes came off of the approved plans prior to construction. Concerning what will or is built is a reflection of the sale price and the building cost. Lots of McStacker in Quail Hill due to the lower construction cost of the 3 story vs. a one or story. Same thing for the garage, with the stinking lot size, there no space for a 3 car that requires land. I guess a car lift can be installed or have a multilevel garage(s). The low discount factor for age in Irvine is a relief. Says people take care of or remodel their house or that the land value is a large factor. It’s the land. Lots of old small places in Turtle rock with the original aluminum 70s windows but a good lot and location go for the big bucks and then get torn down. For once a RE slogan is correct — location, location, location. A house can be built almost anywhere or moved. The location can’t be moved and to change a bad location to a great location takes a lifetime. Too bad the opposition direction is much quicker. Windows can be easily replaced and updated. The teachers in the TR area are great. The parents also sets the tone for the kids’ learning. There lots of great geographic locations in L.A. with views, good commute times to work, shopping and cultural areas, but the neighorhood has gone to the dumps. with crime. Any articles on how to make one part of the county by increaing the crime in the other parts of the county? Irvine is very uniform except for some estate size houses — there really no dangerous neighorhoods other than enviromental polution or old landfill gases leaking out. I followed up with my analysis of Northwood properties for the last two years under $1.25M. With regards to parking, I can see a relation, but what I see emerging as more statistically strong is a fixed-dollar contribution for parking. I see approximately $13K-$15K per additional garage in excess of a 2-car garage which I find more intuitive than a valuation which assigns a 5%+ increase to the valuation of the home. This itself did not have a significant impact on the overall fit. I did find a fairly strong relation with short sales as well, which I think had a bigger impact on the overall fit. I get a similar relationship for incremental baths as for incremental beds (i.e., negative correction) that I don’t think will significantly influence the regression if I didn’t consider baths in the first place. In summary, my current working hypothesis is that considering the square footage, lot size, age and short sale should be sufficient to mostly capture the relevant variables. That still leaves me with a fairly large standard error of around 9% for the overall fit which, I think, reflects various specific location within a zip code, other home-specific idiosyncrasies such as view and upgrades and buyer/seller mindset. Your estimate extra for the garage is about the cost of construction plus extra driveway cost. The cost will vary depending on how fancy the construction — siding, stucco, brick, windows, roof material (tiles, composition shingles). That doesn’t include land cost. There’s a balance. Not very many people will want to pay for a 5 car garage and one bath house, except use the property to remodel or tear down. Its good to know – its along the lines of what I expected. These are all correlated variables, therefore you usually see 5-car garages correlated with high square footage and big lot size and more baths, which is why I think eliminating some of these variables doesn’t significantly alter a valuation model. Are you seriously telling me that you can tell the price difference from a 45 x 85 lot and a 50 x 90 lot? As a realtor, if I presented any of the above comments to a potential buyer, they would say, “Thank you for your time. We’ll find someone else to find a home for us.” All throughout Westpark, Northwood Square, Northwood Park, Tustin Ranch (yes, it is on The Ranch, just not in the school district)there were experiments with density achievements throughout the 1980-2005 time period. Most of this is just BS. When it boils down to resales there are only a few items on the criteria list. I’m skeptical that a buyer would say “find a home” since that’s realtard-speak. SanJoseRenter, you’ve just identified the real problem. We have, those of us who have been in the business for a while, convinced at least 2 generations that residential real estate should be treated just like stock purchases. What’s it’s P/E?, small cap?, large cap? This might come as a huge surprise to you but the word HOME is not retard-speak. Besides any difficulties in obtaining financing, the real problem in the real estate market is that no one is seeing any rise in prices, read…equity (possibly that can be accessed for other uses). SFR, Condo are zoning references. They relate to type of building construction, size of lot, etc. Why doesn’t the building industry just go back to building 1950’s post-war ding-bats all on the same standard sized lots and forget parks, neighborhood shopping, churches, schools, recreational opportunities, etc. ?